Went to one of those Hollywood “A” parties once—just once. How “A” was it? Princess Grace and Prince Rainer were there and they weren’t even the guests of honor. I arrived well fortified, several sarsaparillas with dashes of cherry under my belt. The rest of the party was two drinks behind. Everyone sat posed, subdued and self-conscious. Here I was amid a galaxy of filmdom’s brightest stars, and no one was twinkling—except one starlet. I showed her the Sugarfoot stomp. That night I was a dancin’ fool—with or without a partner. I was the Three Stooges at the wax museum. Would have put on a lamp shade, but they didn’t have my size. Just as I was shifting into high gear my pal carried me on his shoulder out into the night. I was never invited back. Shucks, I didn’t give a rodent’s rear. I had fun, I tell you! What the party lacked, of course, were a few rowdy, bawdy character actors—salt of the earth. On a movie set they’re the morale officers. They add zest to the proceedings. I love to sit near them and listen to all their lies. Nothing knee-slapping funnier than tall tales from the land of celluloid dreams. Hugely enjoyed working with Arthur Hunnicutt (left) on the pilot show of “Sugarfoot.” He was a lanky, shaggy, bearded philosopher with a long, mournful twang. Told me he missed winning an Oscar for his work in “The Big Sky” by one vote to “Viva Zapata”’s Anthony Quinn. If I’d been an Academy member in 1952 Arthur and Anthony would have tied. Arthur was a mellow fellow and he got mellower as the hours passed. I figured he was on a health kick. He ate oranges all day. 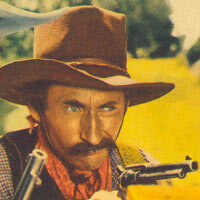 Turned out he laced ‘em with vodka via a hypodermic needle—Ol’ Hunnicutt was a walking screwdriver. 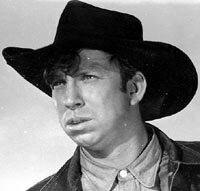 Also working on the pilot was one of the funniest guys I’ve ever met, Slim Pickens (right). One day I was practicing my fast draw and Slim snuck up behind me and shot off a full-load blank from his single action .45. Almost jumped out of my boots, much to the merriment of all gathered on that western street. 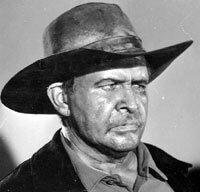 When the smoke and my hysteria settled, Slim told me, “I tried that on Audie Murphy, and he didn’t so much as blink.” On another ‘Sweet Toes’ show, during rehearsal, I rode into town with a cowboy who had been wounded by an Indian arrow. “Where’s the doctor’s office? !” I yelled at Slim. Slim drawled, “Jes’ follow the arrow.” The director was not amused. Slim was formerly one of the world’s greatest rodeo clowns. He told me folks would say to him, “Why, Slim, you’re better than ever—you keep gettin’ closer and closer to them bulls!” Slim was tickled by all the compliments. Then he got to thinking, he didn’t want to get closer to them bulls. He was slowin’ down so he turned in his rubber nose. Yep, he joined the legion of character actors. Adios!